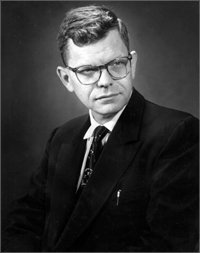 Thomas Lauritsen was Professor of Physics at the California Institute of Technology (1942-1973). Other institutional affiliations included the National Bureau of Standards. His research interests included beta spectra and nuclear spectroscopy. November 16, 1915Birth, Copenhagen (Denmark). 1936Obtained BS, California Institute of Technology, Pasadena (Calif.). 1939Obtained PhD in Physics, California Institute of Technology, Pasadena (Calif.). 1939 – 1940Rockefeller Foundation Fellow in Nuclear Physics, Institute for Theoretical Physics, Copenhagen (Niels Bohr institutet). 1941Assistant Physicist, National Bureau of Standards. 1942 – 1973Research Associate (1942-1945); Senior Fellow (1946-1946); Assistant Professor (1946-1950); Associate Professor (1950-1955); and Professor (1955-1973), California Institute of Technology, Pasadena (Calif.). 1969Member, National Academy of Sciences. October 16, 1973Death, Pasadena (Calif.). Father; PhD advisor at California Institute of Technology, "Construction of a pressure Van de Graaff generator and its application to nuclear physics;" and both employed at California Institute of Technology. Post doctoral advisor at Niels Bohr Institut, University of Copenhagen (Københavns universitet).. Advised by Lauritsen at California Institute of Technology, "Beta spectra of the mass 12 nuclei." Advised by Lauritsen at California Institute of Technology, "A study of the gamma radiation produced in the alpha particle bombardment of O16." Took class from Millikan at California Institute of Technology and both employed there. Obtained BS (1936) and PhD in Physics (1939). Research Associate; Senior Fellow; Assistant Professor; Associate Professor; and Professor. Rockefeller Foundation Fellow in Nuclear Physics. Niels Bohr collection of manuscripts by other authors, 1910-1961. Thomas Lauritsen papers, 1922-1974 (bulk 1952-1973). Oral history interview with Charles A. Barnes, 1987 July and August. Oral history interview with Edwin Ernest Salpeter, 1978 March 30. Oral history interview with Herman William Koch, 1986 September 16 to 11 October 1987. Oral history interview with Ira Bowen, 1968 August 9 and 1969 August 26. Oral history interview with Robert F. Christy, 1994. Oral history interview with Robley D. Evans, 1972 May 2, 3, 1974 May 5 and 1978 June 14. Oral history interview with Thomas Tombrello, 1998 December 2. Oral history interview with Thomas Tombrello, 2010 December 26-31. Oral history interview with Ward Whaling, 1999 April-May. Symposium of the Division of Nuclear Physics [sound recording] : Thomas Lauritsen Memorial Session / 1974 April 24. Energy levels of light nuclei (VII) A-11-12, by F. Ajzenberg-Selove and T. Lauritsen. Thomas Lauritsen Physics Today obituary.